When Lou Segal and his family arrived in Canada in the late 1970's he wasn't overly concerned about how he was going to make a living. The tenous political situation that forced him to leave behind much of his wealth he had accumalated through a thriving cosmetic & pharmaceutical company in SouthAfrica left him with a modest amount in his pocket. In a new country, with little contacts, the future may have seemed pretty bleak. But Segal, a chemist and pharmacist, had something he believed would get him back in business. "I was'nt worried at all," he said. "I had the formula for hair loss, and it worked." The formula Segal speaks of is a concoction he developed from an east African tribal ritual. And now, more than a decade later the product line he developed, and his son Darryl improved, has grown their Vancouver based company, into one of the leading natural hair loss treatment lines in the market place. It was during a safari vacation in the early 1970's when the elder Segal made his "discovery". He came upon a number of tribes performing rituals and noticed that one particular group had thick, strong, healthy heads of hair. "I found out that this one group applied a mixture of plants, roots & leaves to their heads and their faces and would wait for the moon to come out," the elder Segals explains. "The reason was that they felt that the moon would absorb & cleanse their souls of all the evil spirits through the medium of this earthy botanical mixture. What they did'nt realize was that they were unknowingly giving themselves the best hair & scalp treatment nature has to offer. Segal asked the tribe's chief to give him a bucket full of the mixture which he took back to Cape Town where he incorporated it into his scalp formulas, shampoos & conditioners. While the components were all from natural sources, the exact ingredients remains a secret...a valuable one. His new products met with surprising results with many people reporting drastic reductions in hair loss and even new hair growth. But as increasing political uncertainty grew in South Africa, Segal decided it would be best for his family to leave the country. "I was fortunate to have access to my fathers formula," Darryl says. "And as a pharmacist, and being fascinated with the results people were receiving from the product for so many years, my life long commitment to improve on the formula and make it available to as many people as possible." "It was very hard at the beginning," Darryl says. "In a new country, we no longer had the status we achieved in South Africa and had to let the product speak for itself." Today these formulas are available in health food stores under the name Herbal Glo & in salons under the name Segals Solutions. Not only are these products sold across North America, they are also distributed in many other countries including Hong Kong, Australia, New Zealand, Saudi Arabia, Kuwait, Singapore & Malaysia. While the company makes no wild claims that it will grow a new head of hair on its users, it has found that people are getting different degrees of results. 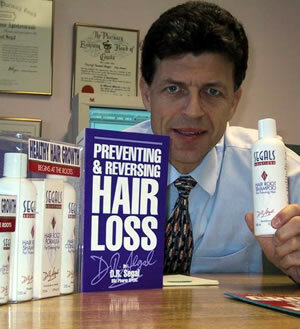 "Some people get more dramatic results such as rapid hair growth within 3 to 4 months," says Darryl. "Others notice a drastic reduction in hair loss. even to be able to keep the hair one has means achieving results." "When there is too much oil secreted, the follicles become clogged up preventing hair growth." he says. "By using our product you will not only clean out the follicles, but also feed the hair roots with natural & essential hair nutrients. "People are looking for a natural alternative to surgery and drug treatments, and we have adapted our formulas to provide that," Darryl says. If you would like any further information regarding these products please call toll free 1-800-663-2285 or visit www.segalshaircare.com. On this site you can watch their 5 minute convincing presentation.